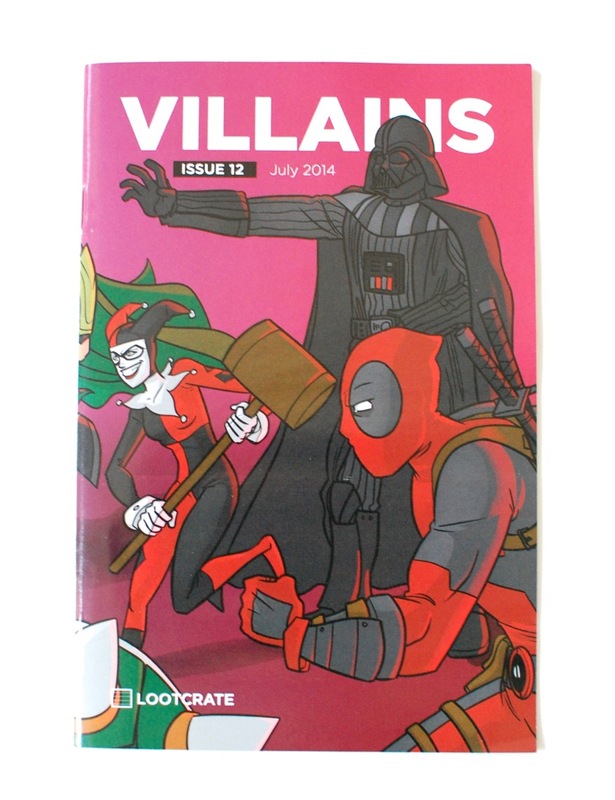 Loot Crate “Villains” July 2014 Review & Discount! 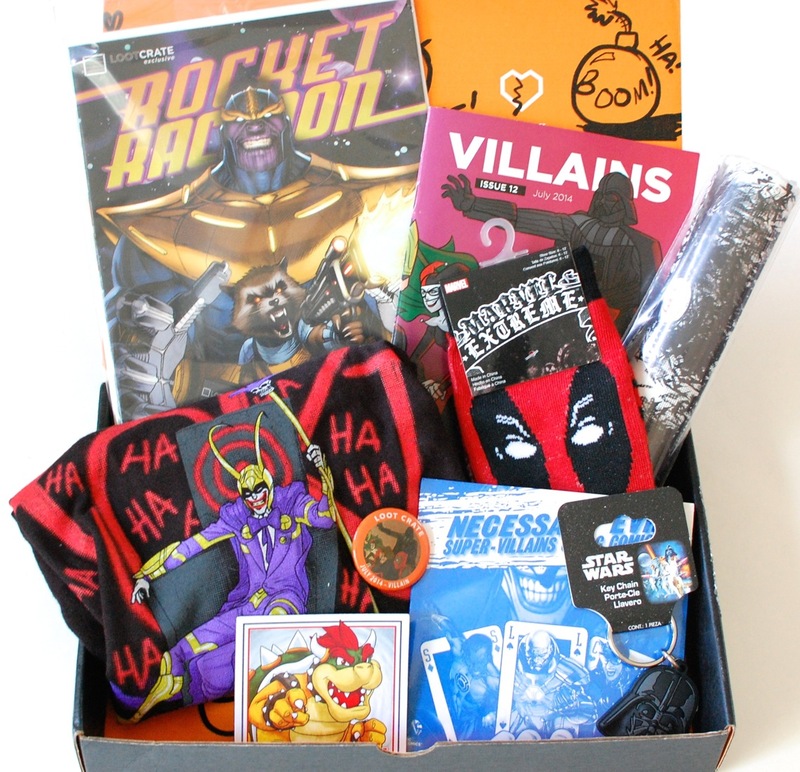 Loot Crate is a monthly subscription box for fans of gamer/geek culture. Every month you’ll get a box with 6-8 items that can include toys, gear, snacks, hardware, art, accessories, and more! Boxes are $19.37/month (price includes shipping), or less with longer subscriptions. This is my third month of Loot Crate, and I think this is probably the best one yet! 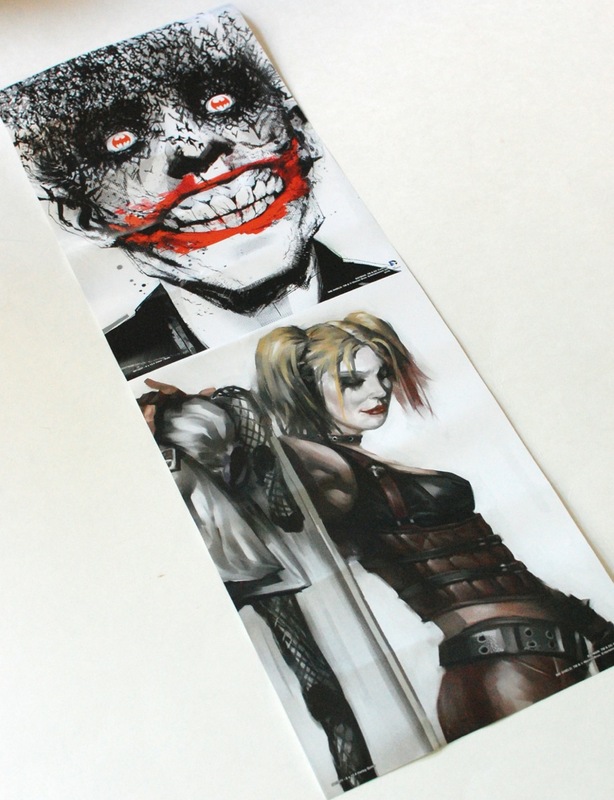 The theme this time is “Villains” and features the “bad guys” of some of the more popular comics/movies/video games. 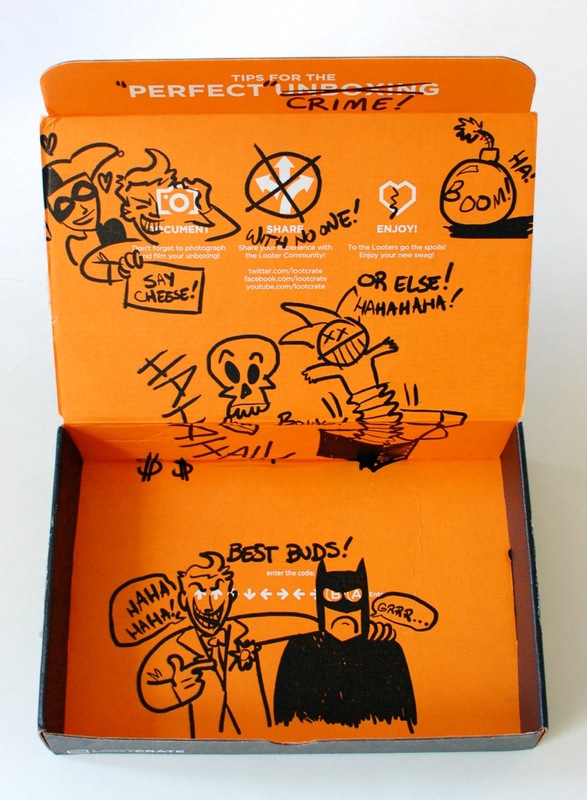 Not only did it include an exclusive comic book and t-shirt, it was also packed with lotsa goodies! Mini Magazine/Info Booklet – The mini mag this month features an interview with Marvel artist Skottie Young, games, product info, and more. 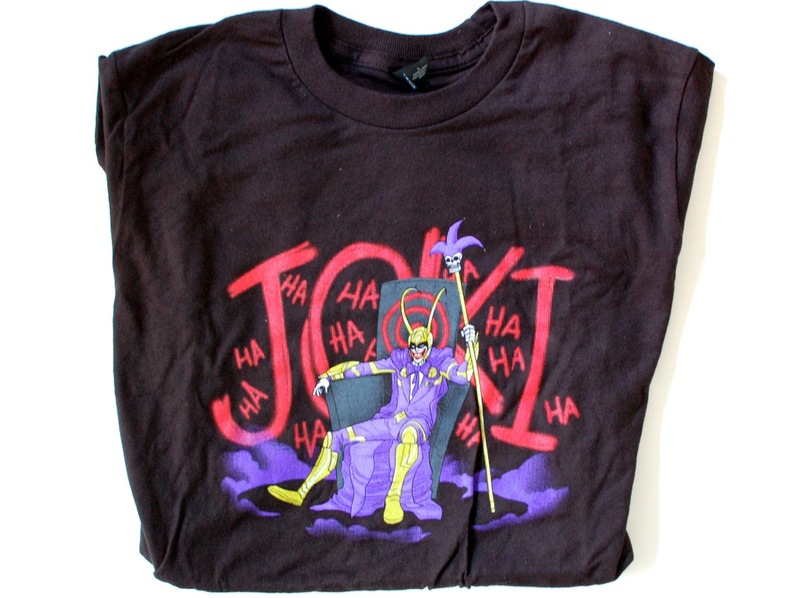 Loot Crate Exclusive “Joki” Villain T-Shirt – My husband is definitely a fan of this shirt (especially since it’s black, he wasn’t too keen on the red one last month). All I know is that it’s a mashup of the Joker from Batman and “Loki”. He tried explaining who Loki was, but I lost interest very fast. 😉 This is a Loot Crate exclusive designed by artist Zack Finfrock. Loot Crate Exclusive Rocket Raccoon Comic – This is another Loot Crate exclusive item! 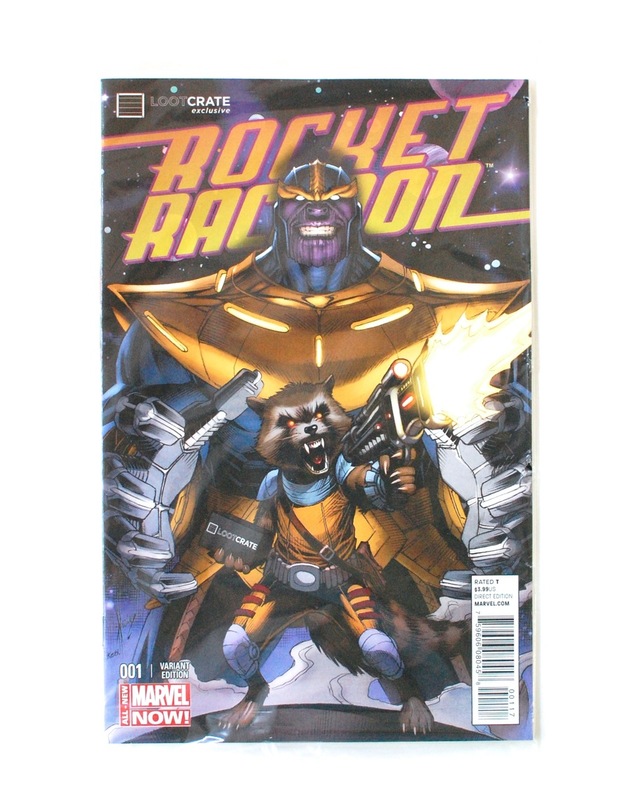 A Rocket Raccoon comic with a variant cover featuring Rocket clutching a gun in one hand, and a Loot Crate in the other. It’s bagged, backed, and sure to be a collector’s item. “Necessary Evil: Super-Villains of DC Comics” DVD – This is a feature-length documentary that takes a look at all of the DC Universe villains over the last 70 years. It’s narrated by Christopher Lee and has pretty positive reviews on Amazon. Marvel Comics Deadpool Socks – Yay, socks! I don’t know who Deadpool is (my husband tried explaining it, but I quickly lost interest… again), but I DO know that I like me some socks. Even when they’re bright red with creepy black eyes on ’em. Darth Vader Key Chain – I remember being little and thinking his name was “Dark Vader”… Cos, ya know, he’s black n’ all. My husband isn’t much of a keychain fan, so this might be going to my nephew who’s pretty into Star Wars. 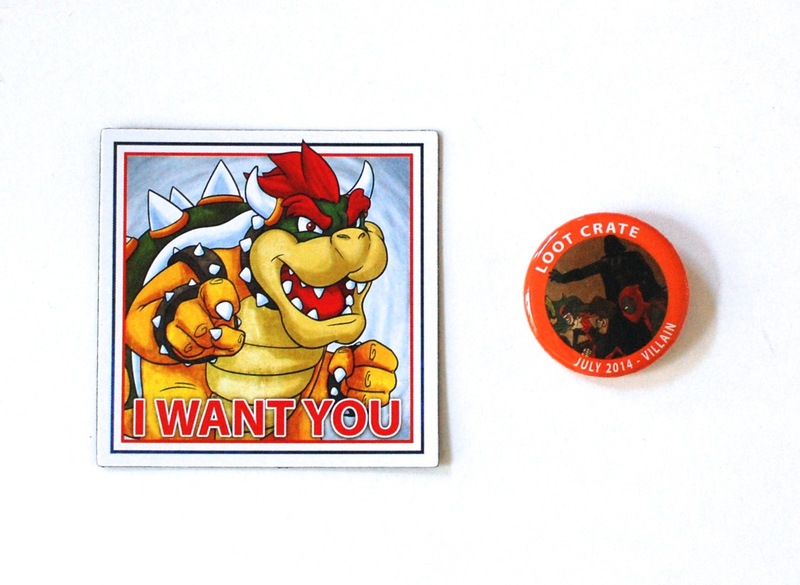 Bowser “I WANT YOU” Magnet – I believe this is another Loot Crate exclusive. I grew up with the original Mario Bros. (well, I didn’t like, go to school with them or anything), so I’m definitely familiar with this dude. He’s one bad mofo. Loot Crate Badge – I never know what to do with these, but they come in every box and feature the date and theme. If you’d like to sign up for Loot Crate, just click here and use the promo code “SAVE10” to save 10% on any subscription plan! Disclosure: I received this box for review purposes. I was not compensated in any way. All opinions are my own. Post may contain affiliate links. Amazon prices subject to change at any time.